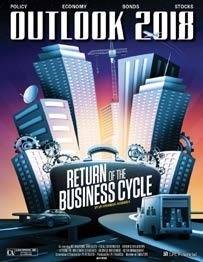 LPL Research Outlook 2018: Return of the Business Cycle | Integrated Wealth Strategies, Inc.
"Return of the business cycle" refers to a return to the traditional forces that have historically propelled the economic cycle forward. Instead of relying on central bank intervention and accommodative monetary policy, we’re turning to some new lead characters to take charge: fiscal policy and better business fundamentals. Fiscal policy means increased government spending, tax cuts, and some regulatory relief. We need Congress to enact some policies to help keep this expansion going. As far as business fundamentals, we expect to see improvement in revenue, earnings, and future growth prospects.